My research field is algebraic combinatorics: I study algebraic structures such as Hopf algebras and partial orders applied on combinatorial objects. I am especially interested in the links between Hopf algebras, partial orders, and polytopes. My favorite objects are permutations and binary trees along with all their associated structures: the Tamari lattice, the weak order, [the Permutohedron]((https://en.wikipedia.org/wiki/Permutohedron), the Associahedron, etc. 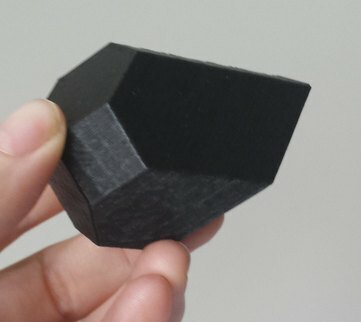 The image on the right is a 3D-printed Permutreehedron: its vertices are counted by some objects, interpolating in-between permutations and binary trees (18 in the example). Software development is an important part of my research often based on computer exploration. The idea is to model mathematical objects through code to allow for experimentation on their properties. A short version of this talk is available here : Lightning talk, SciPy 2014 (30:20). All my papers are available on arXiv (with latex source), on Google Scholar, and on HAL. You will find below my most recent presentations, you can also go through the full list or look by thematic. Please contact me if you need the latex source for any of the presentations. I am listing here all the conferences and research schools which I either organize or where I give a major intervention / training.